PE0281. 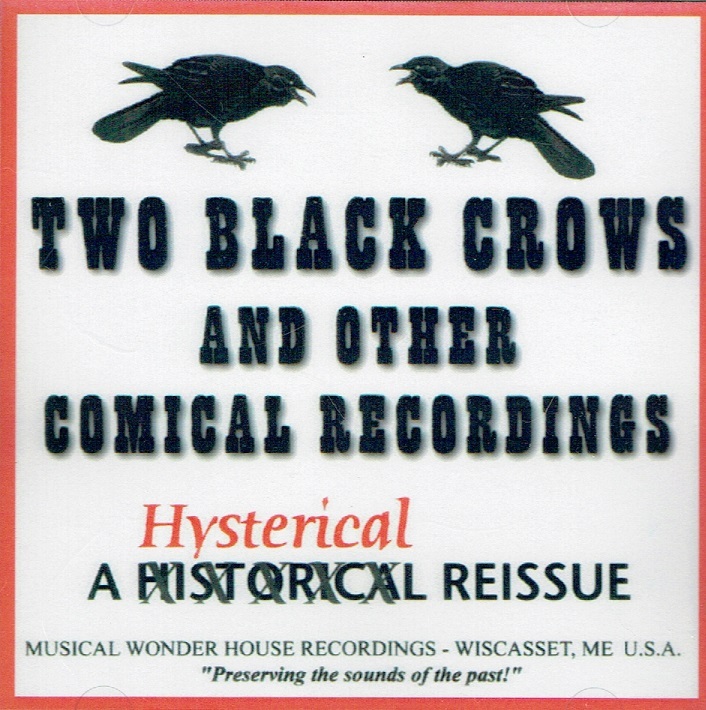 TWO BLACK CROWS and other comical recordings, incl. Moran and Mack, Barney Bernard, Joe Hayman, Ross Taggart, etc. [This long out-of-print CD is now available in a limited number of sealed copies which have just been discovered from the now defunct Musical Wonder House of Wiscasset, Maine.] 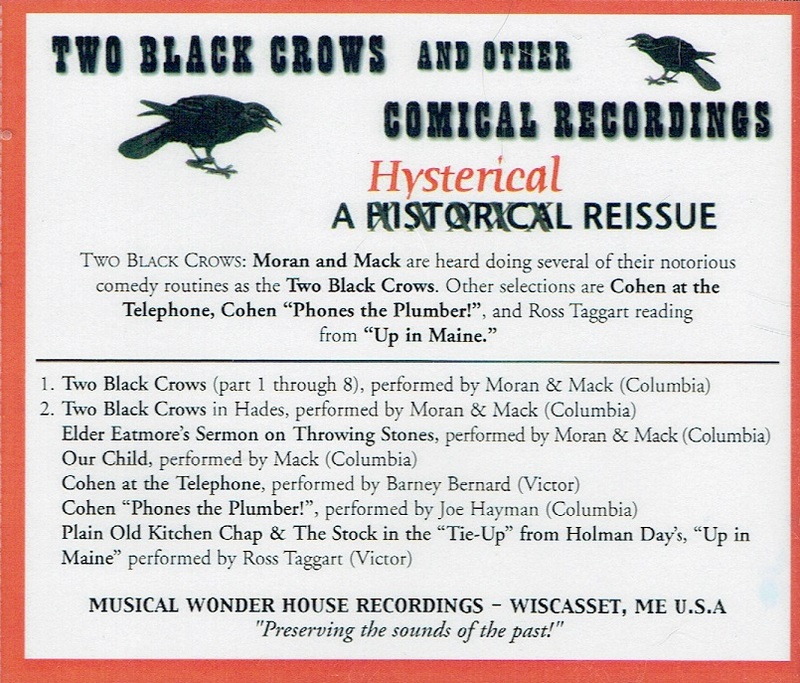 Privately produced by The Musical Wonder House of Wiscasset, Maine. Sealed. 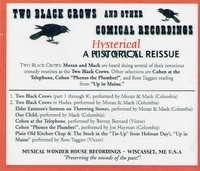 “The Two Black Crows (also called The Black Crows and Moran and Mack) was a blackface comedy act popular in the 1920s and 1930s. The duo appeared in vaudeville, on Broadway, on radio, comedy records, and in film features and shorts. The act was originated by Charles Sellers (1888–1934), who hired actor John Swor as his partner. ‘Swor & Mack’ enjoyed moderate success until Swor left the act. He was replaced by George Moran. The team of Moran and Mack caught on and became major recording stars. ‘The Two Black Crows’ became a weekly radio show in 1928; Moran and Mack also guest-starred on Fred Waring's radio show in 1933. Although Moran and Mack's gags were mostly corny (and very often non-racial) and the characters were stereotypical (one practical but naive, the other seemingly slow and lazy yet quick with a quip and a certain skewed logic), the relationship depicted plus their laconic delivery made them one of the most successful of comedy teams. The team was known for two catchphrases. Moran would remind Mack of some unfortunate event, causing Mack to say, ‘Why bring that up?’ Mack frequently would interrupt Moran's description of something with a drawling ‘What causes that?’. The duo of Moran and Mack appeared in vaudeville with W.C. Fields, on Broadway in the Ziegfeld Follies of 1920 and in Earl Carroll's Vanities in the mid-1920s. They also appeared in George White's Scandals and The Greenwich Village Follies. At the height of their popularity, after completing their first talking feature film, Moran had a salary dispute with Mack and sued him in 1930. A judge ruled that Mack legally owned the act and could pay whatever salary he wanted. Moran quit. He was replaced by John Swor's brother, Bert Swor, who adopted the name Moran. The second ‘Moran and Mack’ talkie (without George Moran) faltered at the box office, and the team made no further films until 1933, when the low-budget Educational Pictures studio hired them for a feature film and a series of ‘Two Black Crows’ short subjects.